« Rock to Rally the Vote: Elisa Parker M.C. In serving as a platform for the voices of women in a variety of disciplines, the Passion into Action Experience™ (PIA) creates a space for women to meet, network, and explore ideas. Attendees are inspired to identify their passion, support a passion, collaborate, network and more. Most importantly PIA provides tools and avenues to help shift concepts & ideas into action. RENEW & create a new dream! Awaken to your purpose-what you’re here to create and align with your passions-how you’re going to get there. Live a life in creativity, love and joy. RECHARGE & CONNECT with other like-minded women in a community that fosters support, authenticity and fun. To be seen and to be listened to for the amazing person that you are. Take care of yourself and come out and play! IGNITE & THRIVE and live a life that sustains your purpose and passion. Rather than lean broken systems and putting on the pant suits, learn how to create new models that are optimized for you as an empowered and creative woman. It’s your time to shine! We understand that you are a change-maker who realizes that you’re here for a reason, to create something in this lifetime that will make a difference. We want to help provide you with the resources, connections and tools to help create the life you’re meant to live. This is a revival for you. The world is waiting for you. You matter. You were made for these times. Join us! Learn from our experienced speakers. Gain know-how and tools to help you either find your passion, further your passion and/or support another’s passion. The intimate conference format provides access to phenomenal keynote speakers, small group discussions, 10 workshops and more. Come out and play at our See Jane Do Slumber Party following Passion into Action at River Highlands Ranch! 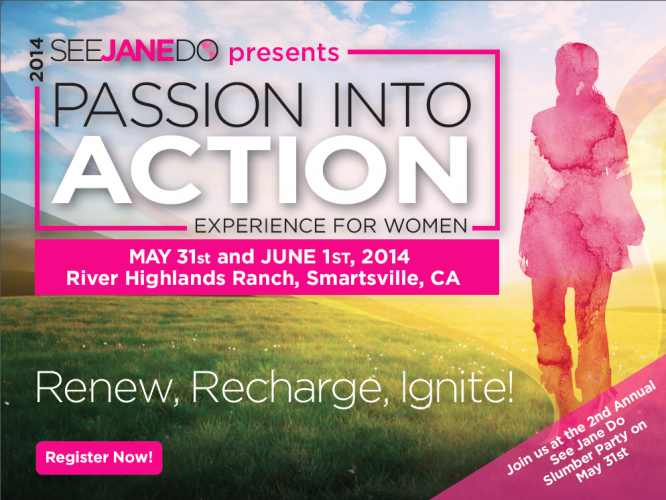 We are thrilled to announce our See Jane Do Passion into Action speakers, leaders & performers for 2014!